Pasta is at the top of my most favorite foods. I like it prepared in most any way, but a pasta salad is great for when it is hot and you want to eat something cool and fresh. Today I will show you how I prepare a pasta salad. It is simple and easy to do, and can be made in advance. You’ll notice that I haven’t put many quantities. That is because I do it by eye; if the amount looks right, then I use it. That being said, there are always leftovers. Begin by putting the pasta on to cook. Here I’ve used macaroni but you can use any small pasta that you have on hand. Shapes like shells, bows, spirals, and tubes are fun for kids and look good. I used 150 gr. of pasta, and for 5 of us, it is more than enough. To save time and water, I first put into the water the veggies that need to cook. I use frozen peas and corn, so I put the peas first and let them cook ’till nearly done. At that point I add the pasta and corn. Depending on the type of pasta you are using, you may or may not want to add the corn yet as it cooks quickly. Other veggies that I have used before include spinach, green beans, onion, lettuce, and more. Wash the veggies well and chop small. You want them smaller than bite size, both to make eating easier and to make it look nicer. Throw them in a large serving bowl as you go. Once the pasta and veggies are done, drain and rinse with cold water. You will want to cool them down so you can add them to the raw veggies. Choose your protein items. I like to use paneer, chickpeas, chunks of cheddar cheese, peanuts and beans. The sprouts mentioned above are also protein. You could also opt for boiled eggs, shredded chicken, canned tuna (or other cooked fish), etc., whatever your personal favorite is. I often mix 2 or 3 protein items into the salad, depending on what I have on hand. Paneer gets used the most, as do chickpeas. I love adding a handful of peanuts as they add crunch and texture. My salad is generally vegetarian since we eat lots of chicken for dinners. Shown below is 200 gr. of paneer, and I don’t cook it. It is cheese so you don’t have to cook it (but you could lightly fry it if you prefer). Just give it a wash when you take it out of the packet. The dressing will give it lots of flavor. Toss in the pasta. The order in which you add stuff to the bowl really doesn’t matter. As you can see, I put the pasta in already but the carrots are still waiting to be chopped. Once everything is in the bowl, it is time for the dressing. You could make the dressing in a separate bowl, but I prefer to make it right on top of the salad since the salad itself is still waiting to be properly mixed. Below you can see all the ingredients (except for the garlic paste) that I use in my dressing – yogurt (that is my very large container of homemade yogurt), olive oil mayonnaise (regular works fine too), salt, pepper, and chili powder. For the dressing I use roughly 1 part mayonnaise to 3 parts yogurt. That serving spoon is what I used to measure so it was one spoon of mayonnaise to 3 of yogurt. Add a small amount of garlic paste, about a 1/2 tsp., and the spices. You will have to judge according to your taste, so if it makes it easier to do so, prepare it in a small bowl so that you can add more salt, pepper or chili powder if needed. Now slowly mix the dressing into the salad. If your bowl is overflowing like mine, take your time. Slowly turn the bowl as you mix the dressing in and combine all the ingredients. Everything should be covered with dressing. Make sure to get down to the bottom of the bowl so nothing is missed. If you didn’t pre-mix and taste your dressing, now is the time to do a taste test, just to be sure there is enough salt and spices. You can always add a little more if needed. This salad can be served right away, or you can chill it in the fridge until needed. I find it actually tastes better the next day, as the flavors in the dressing have had time to blend together. So there you have my pasta salad. If you try it, let me know how it comes out. I hope you like it. Everyone who knows me well knows of my love for pasta. Spagetti, lasagna, or plain noodles and cheese, it doesn’t matter. I could live on it. Unfortunately, my husband doesn’t share the same feelings, saying that pasta is too bland for his taste. The food he was raised on is so spicy that it makes your eyes water, nose run and throat burn, while your mouth feels like it is on fire. I haven’t survived much of that but you can see why he feels anything else is bland.Because of this, I don’t make pasta very often; maybe a few times a month, including my pasta salad. Today I felt the need for some pasta and cheese so I made a simple yet flavorful tomato and cheese pasta. This is about half of what was left. Cook and drain your pasta. Chop tomatos and garlic, and fry in a little oil till almost done. Add a little water if it sticks. Add puree, 1 cup of water and spices, and cook until completely done. 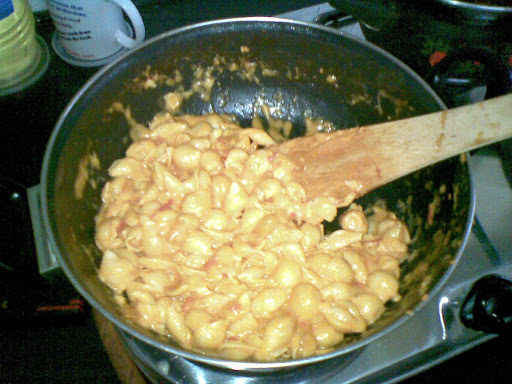 Add pasta and cheeses, mixing until cheese melts. This is great as is, or you could add some mushrooms and green pepper for extra yum.